The unconventional but flawed comedy Going in Style mostly keeps our attention. Mostly. There's a trap in this business that many reviewers seem unable to avoid: they expect too much from movies, either in terms of story, characters, or other unrealistic forces. Not every movie needs to be an Oscar winner, nor does it have to be the best movie you've ever seen. Sometimes movies can merely entertain, like a light dessert that's instantly forgettable but still satisfying at the time. 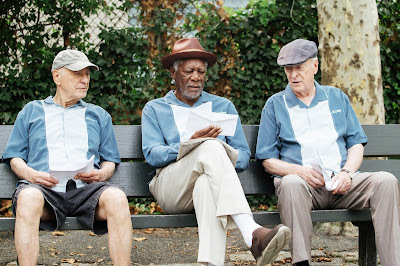 Such is the case with Going in Style, an unconventional comedy that spends way too much time building up its story, only to see it end exactly the way we predicted. Three lifelong friends - Willie (Morgan Freeman), Joe (Michael Caine), and Albert (Alan Arkin) - learn that their steel mill pensions are being ended after the company's sale, putting all three out on the street within 30 days. For Joe it's the most recent slap in the face, after his bank refuses to help him. During his argument with the bank, it becomes the victim of a well-coordinated heist, which makes Joe realize that another option might be on the table: rob the bank that's handling the transfer of his pension. It just so happens that both banks are one in the same, and so Joe traipses off to convince the ailing Willie and Albert without telling Joe's grand-daughter (Joey King). But they'll need help if it's going to happen, and so they embark on one last adventure to either regain their lost pensions or find themselves in prison, which might actually be better than what their evil bank has promised. 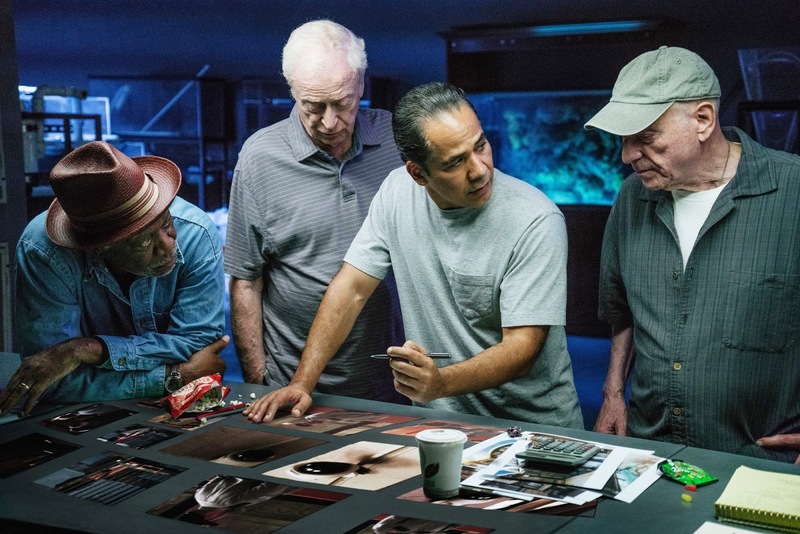 Part of the problem with Going in Style is that we've seen the heist movie done better (see 2001's Ocean's Eleven). With such heights already attained, it's almost impossible to imagine how this one could match up. And yet, it somehow manages to separate itself as an enjoyable character comedy rather than a straight-up heist flick. Central to this is the chemistry of our leads, who effortlessly grace the screen in admittedly predictable patterns. Arkin is (and always has been) the crotchety independent, Freeman the (always) genteel gentlemen, and Caine the passionate Brit. But there's something about these guys running around New York, preparing for the heist and behaving like old men that is at times very rewarding. Caine takes the lead throughout, dispensing advice to King while a worthless side-story about her erstwhile dad (an oddly-crafted Peter Serafinowicz) misses entirely. Luckily, he's minimized throughout but whose original trajectory felt much more involved. Going in Style is also thoroughly predictable. We all know how (most of) this will end, and while there are some nice surprises along the way, everything will turn out ok for our guys. Ann-Margaret plays an elderly cougar who's hunting Arkin, and that makes for some cute moments, along with the thoroughly likable King. But for the most part, if you're not top billing here, you're mostly shoved into a corner until Director Zach Braff needs you. That seems to be the MO for the former Scrubs lead, who makes the trio's story more important than the heist itself. That's an angle I can get behind, because the theft doesn't define the character but instead gives them something to do. Whether it's chowing down on horrible food at the local diner or watching The Bachelorette, Braff is playing to his strong hand by letting these guys run the show. There are some surprises in Writer Theodore Melfi's script, which was based on the 1979 original by Edward Cannon. Those provide some much needed shocks to the plot and keep it from becoming an elderly version of Hell or High Water or Ocean's, especially when it's revealed who robbed the bank the first time around. But it's still a pleasant experience, even when you find yourself wondering when (and if) these guys will actually get around to robbing the bank. So long as you know that Going in Style isn't really concerned with that, you might yourself enjoying the process. In the end, I'm not sure I can recommend Going in Style, not because it's awful but because we've all seen these elements in better films. Our leads make it difficult to raise objections, but so long as you know what you're getting yourself into, then perhaps a matinee will do you right. And there is the possibility that you'll emerge with a smile on your face, not because it's the next big thing but because it simply entertains. 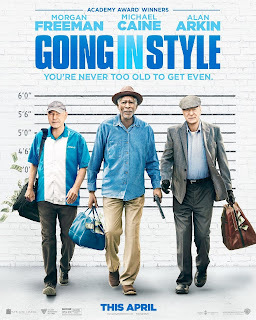 Going in Style is rated PG-13 for drug content, language and some suggestive material and has a runtime of 96 minutes. It was watchable, Michael Caine and Morgan Freeman were brilliant and funny as usual. Didn't like Arkin's character, didn't like watching the strange face of that poor woman who played his love interest. Millicent Martin would have played that role so much better.